A Value List	is a basic entity that contains an enumerated list of strings like those found in a drop down menu. These can be defined statically or as a string list within a component. 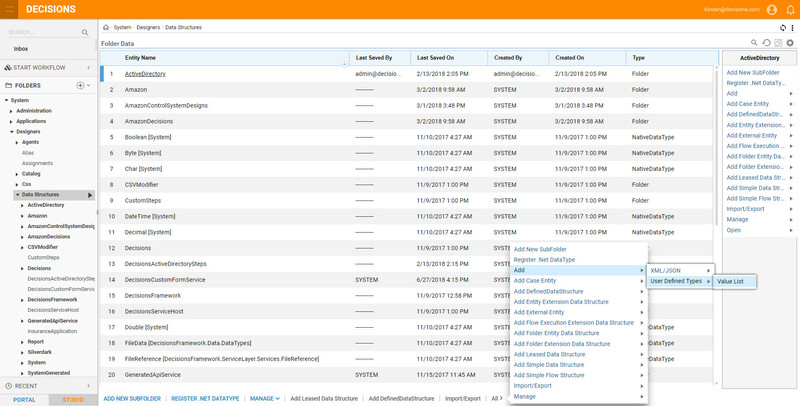 To make a list that is universally accessible by all flows you can create a Value List	. Create a simple value list representing task priorities. Create a flow to use the list. Navigate to the Decisions Studio portal. Expand the System > Designers	folder and click on the Data Structures	folder. To create a new Value List	, click All > Add > User Defined Types	and select Value List	from the pop-up menu. In the Add Value List	[Enum]	window, set the Type Name	as Priority Level	. Next we have to add items to our Value List. 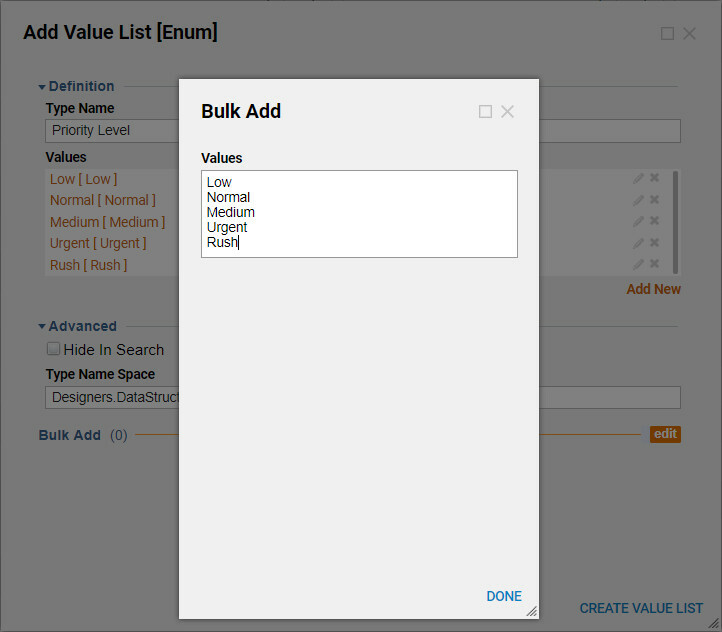 Since we know what values we want our list to contain we can select the Bulk Add	option. Select Done. Select Create Value List. The Value List	is now available for use. It is important to collect the Data Type Name	for this list. It will be used when the flow is created. 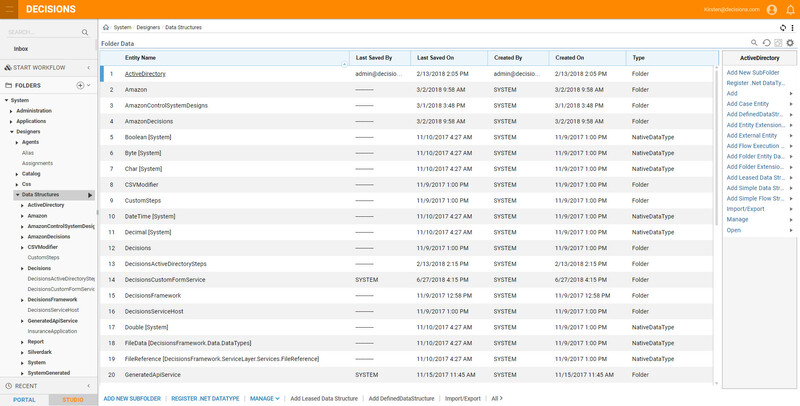 To find the data type full name, select the newly created value list entity and view the detailed information in the Properties Panel on the bottom right corner of the screen. 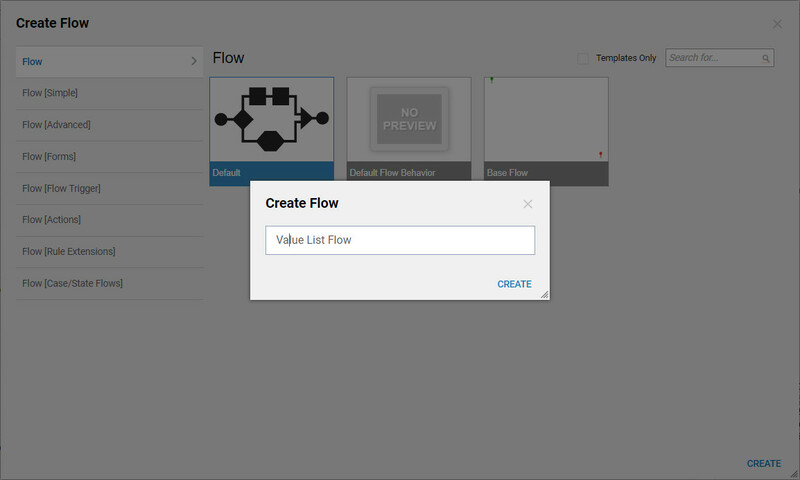 Navigate to a Designer Folder	and click on the Create Flow	button. In the resulting New Flow	popup window, name the flow and click OK	. The first step is to get the Value List	that was just created. 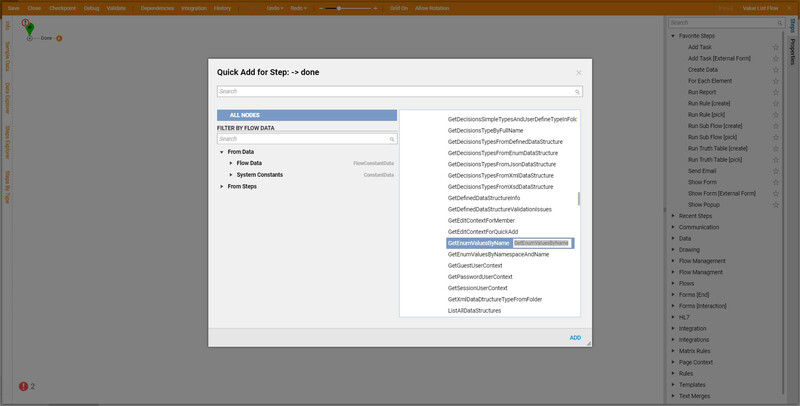 To do this, in the Flow Designer Quick Add window expand the Integrations > All Integrations > Internal Services > Data Structure Services	categories and select Get Enum Values By Name	component. Click Add	to add it to the workspace. Select the Get	Enum Values By Name	step and under Inputs >	fullName	define the Mapping Type	as Constant	. In the Value	field, enter the Data Type Full Name	that was collected earlier in the example. For visual purposes, this example will display the different items in the Value List	as popup notifications to the user. To do this will need to use a ForEach Step. 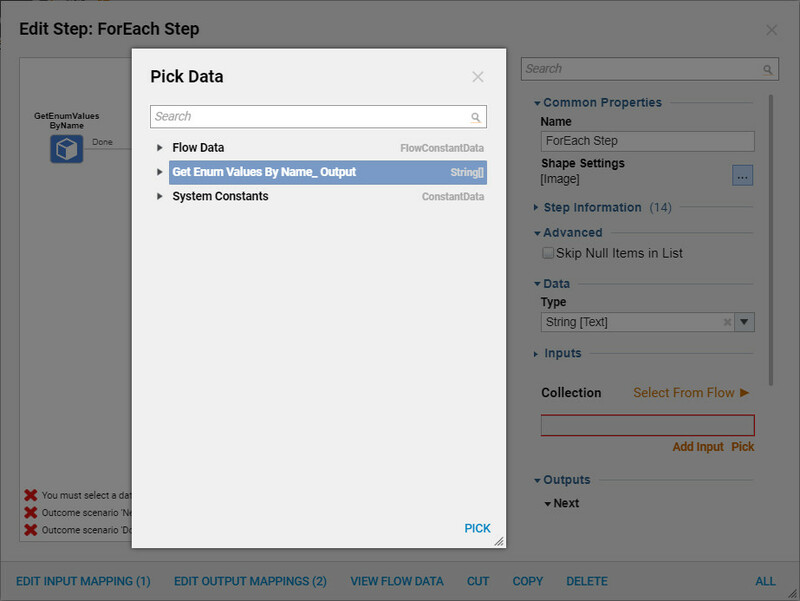 In the Steps panel	go to Flow Management	and select a ForEach Step	component to add it into the workspace. 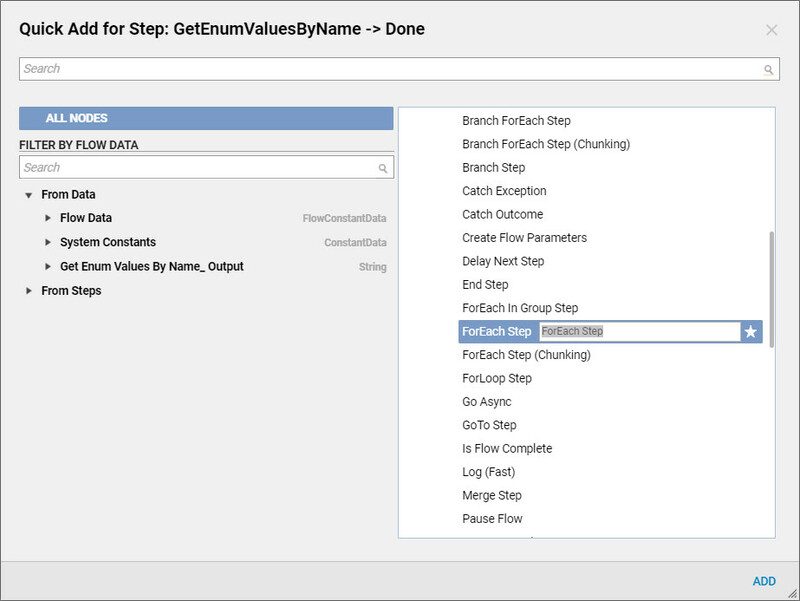 In the Edit Step	dialog of the ForEach Step,	under Data > Type,	select String	from the drop down menu. In the Inputs	section, click on the Mapping Type	drop down menu and select the Select Value	option. Then click on the Pick	button and in the resulting popup window, select GetEnumValuesByName_Output	and click Pick	. Now, in the Toolbox Panel	, go to Communication	and select a Send Notification	component and add it into the workspace. Select the Send Notification	step and in the Edit Step	dialog select the Add New	button in the Notify To	> Notify User	section. 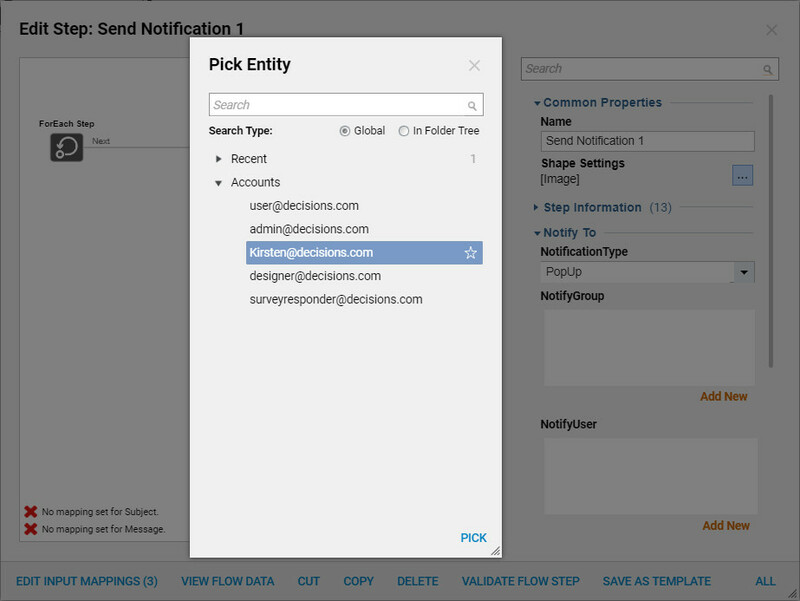 In the resulting Pick Entity	dialog, select the user to be notified and click the Pick	button. 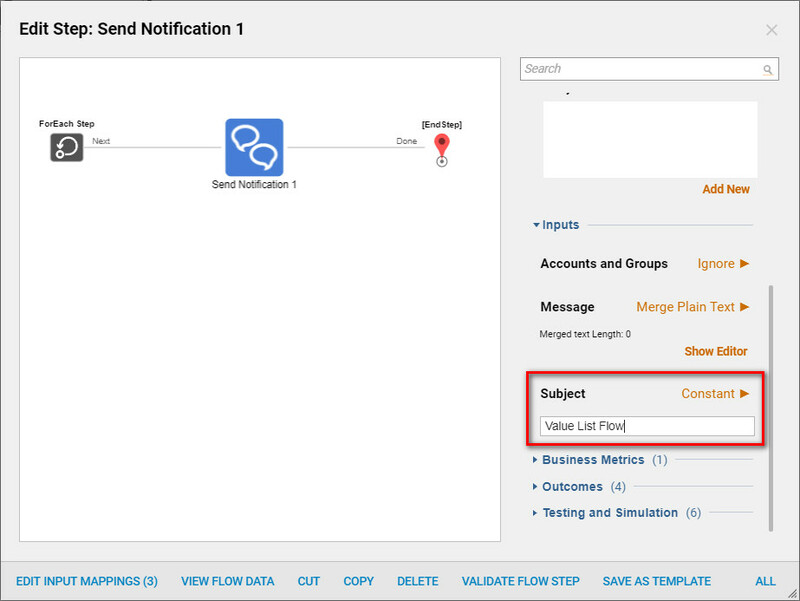 Next, configure the inputs to the Send Notification	step. Under I	nputs	>	Message	, select the Text Merge.Plain	from the drop down list. 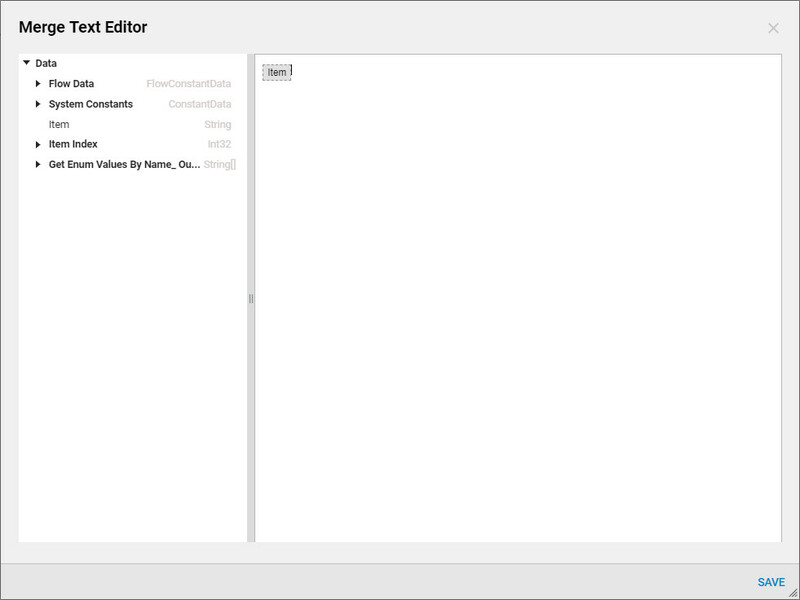 Then click the Show Editor	button for the Merged Text	item. In the resulting Merge Text Editor	popup window, hover over Item	and click Add	. Close the Editor. 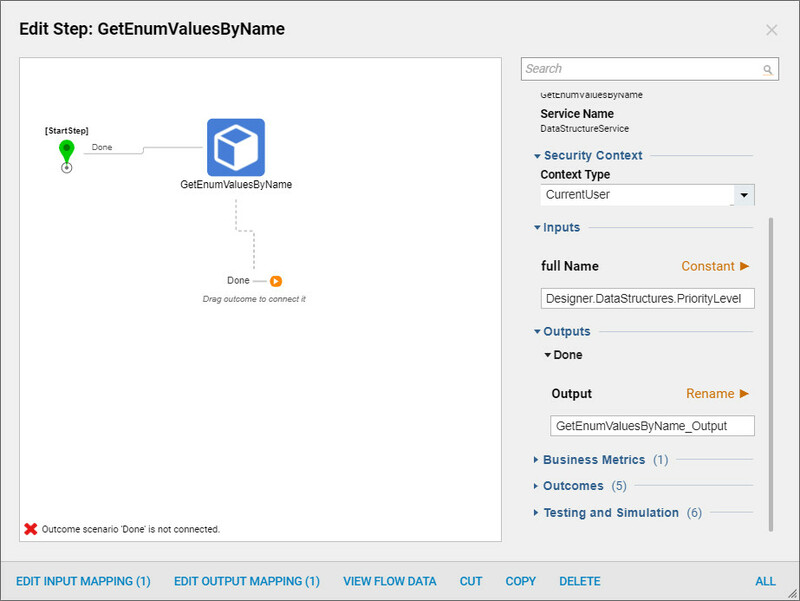 Finally, in the Inputs	section, under the Subject	section, set the Mapping Type	to constant and name the Value	field “Enum Flow”. 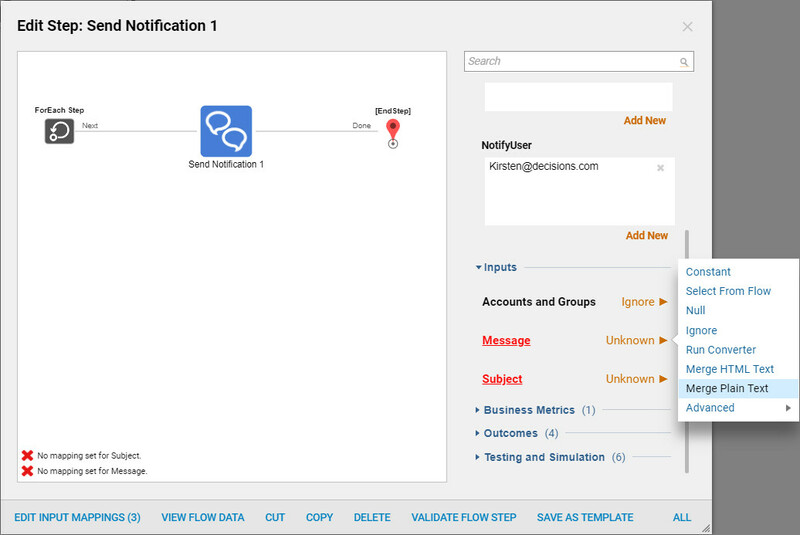 Ensure all of the flow steps are properly connected and correct any validation errors that exist. To verify the flow is properly configured, click on the Debug	button at the top of the screen. When the debugger finishes, the execution path is highlighted and the notifications are displayed on the screen.